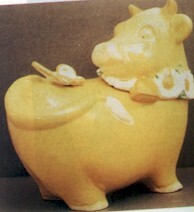 Yellow Cow cookie jar by Metlox. Marked "made in CA Poppytrail". Slight rubbing on eyebrows.